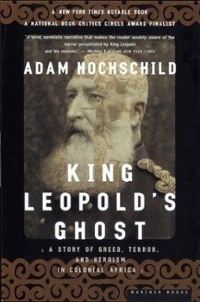 King Leopold's Ghost 0 Edition In the 1880s, as the European powers were carving up Africa, King Leopold II of Belgium seized for himself the vast and mostly unexplored territory surrounding the Congo River. Carrying out a genocidal plundering of the Congo, he looted its rubber, brutalized its people, and ultimately slashed its population by ten million--all the while shrewdly cultivating his reputation as a great humanitarian. Heroic efforts to expose these crimes eventually led to the first great human rights movement of the twentieth century, in which everyone from Mark Twain to the Archbishop of Canterbury participated. King Leopold's Ghost is the haunting account of a megalomaniac of monstrous proportions, a man as cunning, charming, and cruel as any of the great Shakespearean villains. It is also the deeply moving portrait of those who fought Leopold: a brave handful of missionaries, travelers, and young idealists who went to Africa for work or adventure and unexpectedly found themselves witnesses to a holocaust. Adam Hochschild brings this largely untold story alive with the wit and skill of a Barbara Tuchman. Like her, he knows that history often provides a far richer cast of characters than any novelist could invent. Chief among them is Edmund Morel, a young British shipping agent who went on to lead the international crusade against Leopold. Another hero of this tale, the Irish patriot Roger Casement, ended his life on a London gallows. Two courageous black Americans, George Washington Williams and William Sheppard, risked much to bring evidence of the Congo atrocities to the outside world. Sailing into the middle of the story was a young Congo River steamboat officer named Joseph Conrad. And looming above them all, the duplicitous billionaire King Leopold II. With great power and compassion, King Leopold's Ghost will brand the tragedy of the Congo--too long forgotten--onto the conscience of the West.